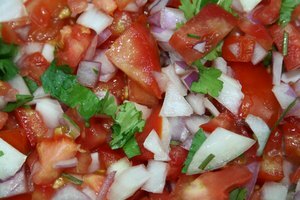 : Intermediate The delicate tang of sweet pickle relish is a summertime favorite whether slathered on a stadium hot dog or a hamburger on a backyard grill. 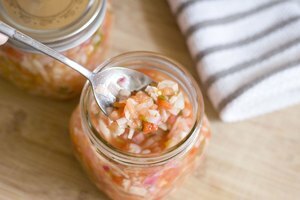 Making and preserving your own sweet pickle relish with cucumbers harvested from your garden or purchased from the farmer's market is a relatively inexpensive way to ensure you'll have this condiment readily available in your pantry year-round.
. Drain the cucumber mixture into a mesh sieve placed over a bowl. Alternatively, drain it in a colander placed in the sink. from the relish mixture to the top of the jar.
. Turn off the heat when the canning time has ended. Remove the lid. Carefully remove the jars from the water using a jar lifter, and place them on a kitchen towel that has been spread onto a work surface or table. Allow the jars to cool, leaving at least 1 inch of space between them.
. After the pickle relish is completely cooled, press down on each lid to ensure there is no "give." If there is no bulge in the center of the lid, and if that part of the lid does not move up and down when pressed, it is sealed. to prevent a film from forming on the jars.